It’s getting exciting at the Fox Theater Oakland, as preparations take place for the incredible duo Sylvan Esso on Tuesday 22nd August 2017! With support from the amazing Flock Of Dimes. This exciting show, bursting full of talent, will leave you speechless, so don't delay – book now! Click the Buy Tickets button to get yours today. There's a whole heap of excitement brewing at Fox Theater Oakland, as preparations take place for Sylvan Esso on Tuesday 22nd August 2017! This exciting show, which is chock full of talent, will leave you speechless, so don't delay – book now! Click the Buy Tickets button to get yours today. Formed in Durham, North Carolina, Sylvan Esso are an atmospheric synthpop duo, the project of singer-songwriter Amelia Meath and producer Nick Sanborn. Amelia Meath, singer for harmony folk trio Mountain Man, and Nick Sanborn, of psychadelic folk act Megafaun, come from very different backgrounds, but in each other found the perfect collaborative team for a sound that was entirely new. Though both members play in every different sounding bands as their day jobs, the duo formed in 2013 and released a highly acclaimed debut studio album in 2014. Live, Sylvan Esso far exceed the already high expectations you may have from listening to their recorded material. Their show is high-energy, with hypnotic rhythms, a dazzling sound and light show, and fantastic audience engagement from singer Amelia Meath, who puts every ounce of her soul into her onstage performance, forging a connection with fans that is rare to see! 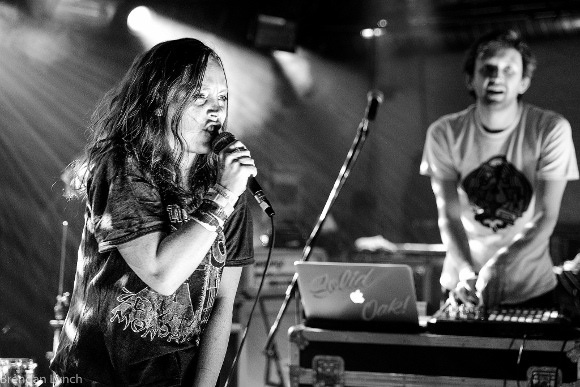 Don’t miss out – get your tickets to see Sylvan Esso NOW! !